This blog is maintained by Kim Flintoff. Currently working as an education futurist, drawing on my experience as a seasoned educator who has worked at all levels and sectors of education K-12, higher education, state, CEO and independent, locally, nationally and internationally. My current roles in higher education draw upon my diverse experience in performing arts, applied science, technical and creative management, educational leadership, arts and education research to position me amongst thought leaders shaping the future direction of education and learning engagement within Curtin University and across our partners and collaborators in libraries, museums, galleries, sustainable development agencies, global education, etc. Current work focusses include games and gamification in learning contexts, new platforms for collaborative global learning, challenge-based engagement, sustainability education, learning by making, transmedia approaches to learning engagement, micro-credentialling and badging approaches, computational learning, learning analytics and other big data strategies in the higher education sector. I was previously employed by Curtin University of Technology (Office of Teaching and Learning, School of Regional, Remote and eLearning) as an Instructional Designer where my duties see me mentoring staff as they transition to Flexible Learning strategies, and project managing a range of undertakings. 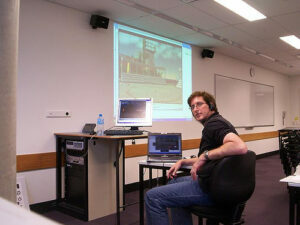 Until 2008, I ws working as a sessional lecturer and tutor in the Contemporary Performance program at Edith Cowan University. I also teach in the Drama Education and Primary Education programs as required. And if doing my PhD research and sessional teaching isn’t enough I also supervise pre-service teachers, manage an island in Second Life, front-of-house management at the Perth Concert Hall and Government House Ballroom, and during 2008 I was engaged by Presbyterian Ladies College (WA) to mentor staff and conduct practical research into effective teaching practices to support hte school’s 1-1 laptop program. I taught in the Creative Industries Faculty of the Queensland University of Technology where I’m also working on a PhD (Developing a model for Process Drama using networked technologies). I was briefly appointed as Director of Public Relations for the International Drama/Theatre and Education Association. I have an extensive background in theatre production. While currently examining the implications of technology and virtual domains in educational Drama, I’m also interested in NLP, brain-based and accelerated learning applications, student-centered and co-operative learning. I’m co-founder and former chairman of Class Act Theatre (Theatre-in-Education) and founder and present chairman of SHY (Seen and Heard Youth. He was Director of Technology for Drama Australia and I was the first Technology Officer of DramaWest (1996-2001). In 2001, In was asked to co-chair a Special Interest Group for Drama and New Media at the IDEA2001 (International Drama/Theatre and Education Association) World Congress held in Bergen, Norway and have reprised that role at IDEA2004 in Ottawa, Canada, and 2007 in Hong Kong. I have been asked to continue my involvement as we look to the next IDEA congress in Belem, Brazil, 2010. A regular presenter at local, national and international conferences, I also moderate and maintain a range of Drama Education websites (http://drama-education.com) and discussion groups on the internet; recently launched DramaPlayShop (http://sig7.org). Additionally, I was a Curriculum Council Drama Moderator, member of MindMatters WA Working Party, member of Black Swan Theatre’s education group and a part-time web designer.